Would religions survive if children were not brainwashed into them? Whether “indoctrination” of an empty child’s mind is less reprehensible than the “brainwashing” of an adult mind that has existing beliefs is not the point. At issue is whether beliefs, which, by definition, exist outside the realm of knowledge, can be force-fed. No religion allows its followers to develop their own beliefs. All religions presume to instill their standard beliefs onto their own adherents and onto potential converts. Can beliefs be externally imposed or must they be developed internally? My own “belief” is that an idea, which is not the result of an individual’s own cognitive processes but is externally imposed, cannot be a true “belief”. All societies permit, and most approve, the indoctrination of children into the religions of their parents (or guardians). Apart from coerced conversions (which are still going on), I would guess that over 95% (and perhaps 99%) of all those who follow a religion, follow that of their parents. Human behaviour has effectively made religion hereditary. Religion is not controlled by our genes except in that our genes may determine how susceptible we are to indoctrination. Yet our religious beliefs are determined by who our parents are. Unfortunately parents have not succeeded as well in indoctrinating children away from other undesirable behaviour. 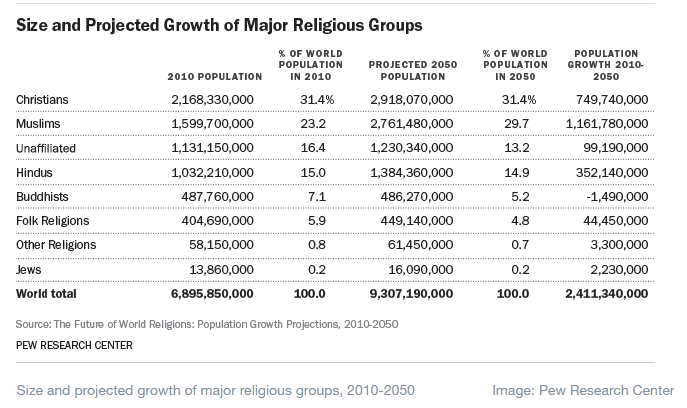 The growth or decline of religions across the world simply mirrors fertility on the one hand and the coercive conversion of peoples into the religion. If a group of children were brought up in isolation on a desert island, by robotic instructors confined to teach only in the area of knowledge, and to answer any question in the space of ignorance with a “don’t know”, some of the children may well develop “religious” beliefs with divine power being attributed to the sun and the moon and the winds and the waves. But for there to be war between the sun-worshipers and the wind-worshipers there would first need to be those arrogant enough to anoint themselves as priests. There would be no organised religions without priests appointing themselves as special messengers of the divine powers. There would be no religious wars without “turbulent priests” bent on religious expansion. If every child was allowed, as it felt necessary, to develop its own religious beliefs, organised religions would never catch hold. And if organised religions did exist they would merely wither and die without a continuous stream of new adherents in the form of brain-washed children growing up. The problem lies not in whether one believes in gods or not, but in that organised religions exist and that they compete. They compete by claiming that one set of beliefs in the space of ignorance are superior or better than another set, also in the space of ignorance. The claims for the one or for the other are made by turbulent priests. It has been so ever since organised religions came into being. It is still so today, whether it is a mad mullah pronouncing a fatwa or a Hindu God-man calling for the destruction of a mosque or a Buddhist monk attacking unbelievers or a “celibate” Pope pronouncing on family values. This entry was posted on May 25, 2017 at 5:15 pm and is filed under Behaviour, Religion, Uncategorized. You can follow any responses to this entry through the RSS 2.0 feed. Both comments and pings are currently closed. Would children survive if they were not “brainwashed” into them?